Jakkree Wichairahad, Pairat Kaewsarn, Wiparat Nisapai, Sirintra Tan-Intara-Art and Waraporn Chanwiang. “The strength analysis of an agriculture truck chassis using finite element method”. KKU Engineering Journal. 2016;43(S2): 267-270. Jakkree Wichairahad, Poonyapat Thablakhorn and Nattwut Tonglor. “FINITE ELEMENT ANALYSIS FOR STRENGTH OF AN AGRICULTURE TRUCK PICK-UP: COMPARISON BETWEEN BEAM AND SOLID ELEMENT”. International Journal of Mechanical And Production Engineering. 2016;4(8): p147-150. Jakkree Wichairahad, Sirintra Tan-Intara-Art and Wiparat Nisapai. “The Calculation Techniques of Non-Matrix Representation Flexible Joint Stiffness to Improve the Accuracy of Beam Element FEA”. Proceeding of 6th International Conference on Electronics, Computer and Manufacturing Engineering. Singapore, March 29-30, 2017, p299-303. Jakkree Wichairahad, Poonyapat Thablakhorn and Nattwut Tonglor. “The Strength Analysis of an Agriculture Truck Chassis using Finite Element Method”. 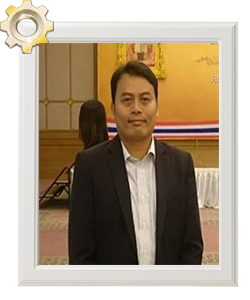 Proceeding of the 6th KKU International Engineering Conference 2016, Khon Kaen, Thailand, August 3-5, 2016. p133. Jakkree Wichairahad, Poonyapat Thablakhorn and Nattwut Tonglor. “FINITE ELEMENT ANALYSIS FOR STRENGTH OF AN AGRICULTURE TRUCK PICK-UP: COMPARISON BETWEEN BEAM AND SOLID ELEMENT”. Proceedings of 38th The IRES International Conference, Singapore, 3rd June 2016: 30-33. Jakkree Wichairahad, Poonyapat Thablakhorn and Nattwut Tonglor. “The Strength Analysis of an Agriculture Truck Pick-up using Finite Element Method”. Proceeding of 2016 International Conference on Advances in Software, Control and Mechanical Engineering. Kyoto, Japan, April 12-13, 2016, p41-46. J. Wichairahad and S. Rooppakhun. “The Strength Analysis of a Bus Superstructure based on the Accuracy Improvement of T-Junction Joint Stiffness”. Proceeding of 4th International Conference on Adavanced Manufacturing Technology. Johor Bahru, Malaysia, September 20-22, 2015. p76. จักรี วิชัยระหัด, เอกลักษณ์ พรมภักดี และ สุภกิจ รูปขันธ์. “การวิเคราะห์ความแข็งแรงโครงสร้างรถโดยสารมาตรฐาน 1 ภายใต้ภาระพื้นฐานด้วยระเบียบวิธีไฟไนต์เอลิเมนต์”. การประชุมวิชาการเครือข่ายวิศวกรรมเครื่องกลแห่งประเทศไทย ครั้งที่ 28. ขอนแก่น, 15-17 ตุลาคม 2557, p117-118. เอกลักษณ์ พรมภักดี, จักรี วิชัยระหัด และ สุภกิจ รูปขันธ์. “การวิเคราะห์ความแข็งแรงของโครงฐานรถโดยสารประเภทสองชั้น ด้วยระเบียบวิธีไฟไนเอลิเมนต์”. การประชุมวิชาการเครือข่ายวิศวกรรมเครื่องกลแห่งประเทศไทย ครั้งที่ 28. ขอนแก่น, 15-17 ตุลาคม 2557, p129-130. – In House & Out Source Parts. – VA. : Reduce material. Job description: New model project leader.